This Lunar New Year instead of getting too engrossed with your smartphones, why not hit play on your favourite playlist on Spotify and connect with your family. New Year is a time for well wishes, reunions and feasting, as we gather together with our families. For the Year of the Dog, Spotify has a playlist that will complement your celebrations. Scan the above Spotify Codes to get to the playlist. To scan a Spotify Code, simply click on the new camera icon located to the right of the Search bar, scan the artwork, and be directed immediately to that piece of content. To share playlists via Spotify Codes, simply tap on the “…” context menu and you will see a Spotify Code appended to the bottom of the artwork. By tapping on the Code-enhanced artwork you can also save it to your Camera Roll for easy and quick social sharing. 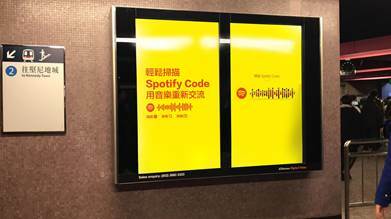 If you are out and about the city area, look out for the Spotify Codes and enjoy the music. We wish you a Happy Lunar New Year and may it be a year filled with happiness, prosperity and longevity.